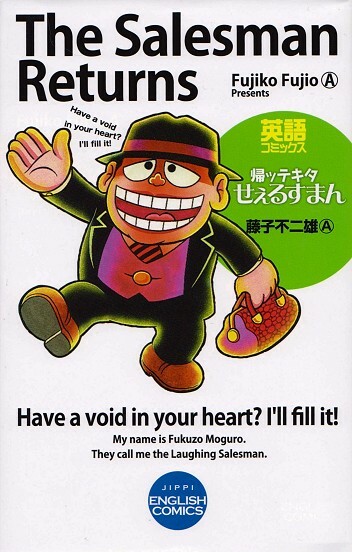 THE LAUGHING Salesman Fukuzo Moguro makes dreams come true, but the price may be high. 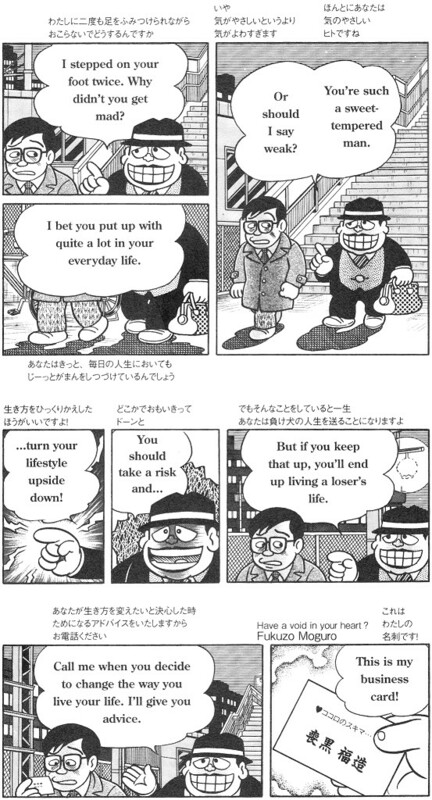 This Mephisto-like peddler of happiness is the star of Fujiko Fujio (A)’s manga classic for grown-ups. It has not lost its timeliness in 40 years. The Japanese Jitsugyo no Nihonsha released recently three bilingual versions of classical mangas in the series Jippi English Comics. They have texts in both English and Japanese. Two publications are works of Osamu Tezuka, quite familiar for western readers. Mighty Atom Best Selection contains adventures of Astro Boy (Tetsuwan Atomu). Jungle Emperor Leo – Leo Edition is the famous story of Leo, aka Kimba the White Lion. Astro Boy’s adventures have been published in English in the early 2000s. The manga Janguru Taitei has not been translated into English before, but the anime version is well known. The manga was released in Finnish by Sangatsu Manga quite recently. The most interesting of the three bilingual books is the third one, The Salesman Returns. As far as I know, it is the first English translation of any manga by Fujiko Fujio (A). The style of the manga has changed only a little with the decades. This example is from the 1960s, all the other images are from the 1990s. THE NICKNAME Fujiko Fujio drew manga from 1954 to 1987. His best-known work is the super-popular children’s manga Doraemon. Behind the nickname there were two artists, also known with their separate nicknames Fujiko F. Fujio and Fujuki Fujio (A). The F-half is actually Hiroshi Fujimoto (1933-1996), and the A-half is Motoo Abiko (1934-). Abiko has also used the name Fujiko Fujio Ē. Compared with the immense popularity in Japan, Fujiko Fujio is quite unknown outside of Asia. The French publisher Kana has given out 22 books of Doraemon adventures. According to Wikipedia, some Doraemon is coming out in English for the Amazon Kindle in the near future. 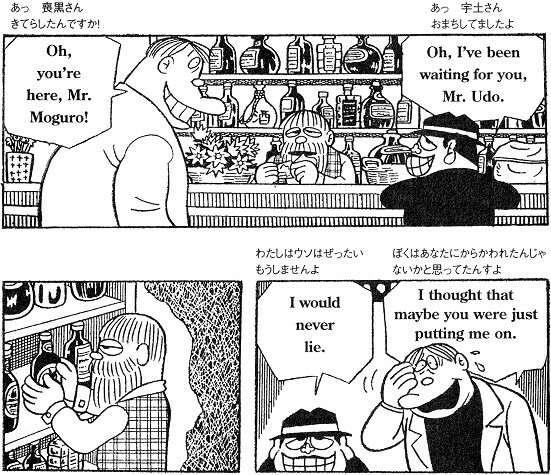 As far as I know, The Salesman Returns is the first Fujiko Fujio (A)’s solo work in any Western language. The stories of The Salesman Returns / Kaettekita seerusuman in the Jippi-series have been gathered from two sources. Five stories are from the follow-up to the classic Kaettekita seerusuman done in 1996-2000. In addition, there are three stories that were drawn for the original series Buraku seerusuman (”The Black Salesman”) in 1968-1971. These three chapters were not published at the time. In Japan, the whole series of works is best known as Warau seerusuman (”The Laughing Salesman”), which is the name of the anime series run in the late 1980’s. 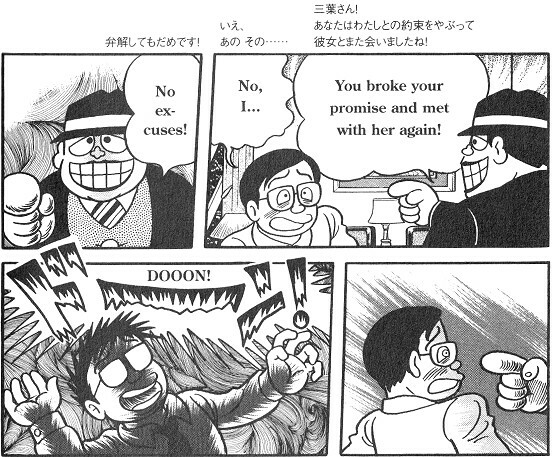 THE STAR of the manga, Fukuzo Moguro, is a friendly but rancid salesman who sells the realization of dreams. He never actually lies, but he never tells the whole truth. ”Have a void in your heart? I’ll fill it!” Moguro promises. With his magic powers, Moguro detects his potential customers even in the middle of a crowd: people who have a strong passion unfulfilled. When a customer has been spotted, Moguro forces himself on him, little caring about the Japanese rules of politeness. Moguro is able to organize anything: good sales for a bad artist, meetings with a television star for a nobody, a luxury apartment for a dissatisfied manga artist in his lowly flat, a journey around the world plus a foreign lover for an aging lady. If you lust for too much, you will suffer. EVEN though the Salesman series is comedy, it is clearly adult manga. In the late 1960s, it was much different from Fujiko Fujio’s other works. Thus, the fan base was relatively small, but all the more eager. The Laughing Salesman became the common property of all Japanese only with the television anime in 1989 to 1992. The Salesman is adult manga because of its topics. With the means of black comedy it deals with things like sado-masochism, problems in getting married and pedophilia. It explores the lust for money and property. It cruelly shows people in all their envy, resentment and fraudulence. The Salesman is adult manga also because the way it uses comedy. Fukuzo Moguro is a very interesting gatekeeper of passions, actually quite a Devil. Moguro and his trusty bag intrude on people’s lives, smiling and relaxed. He makes a very attractive offer that seem to make the customer’s most secret dreams come true. But every offer includes a grim epilogue. You will have to take the bitter pill, if what you get is not enough for you. If the manga had a message, it would be something like this: Be satisfied with your lot. If you get a moment of happiness, enjoy it. If you crave more, you are lost. If you give the Devil your little finger, he takes the hand, and a lot more. And laughs. But I do not think that Fujiko Fujio (A) intended to give a message. It is sufficient that Unscrupulous people are displayed and ridiculed. The gutters between panels have been enlarged to fit the text properly. THE BILINGUAL form of the manga has been implemented quite elegantly. English text is in the bubbles. Japanese text is located outside the panels but near the bubbles. The gutter between the panels has been enlarged so that the text fits properly. Sound effects are in original Japanese. The English equivalents are placed outside the panels. In addition to the manga, there are 20 ”lessons”. They explain idioms of the English language for Japanese readers. It must be remembered that the book is primarily intended for Japanese people learning English. The benefit for us international manga fans is probably unintended.